Investments in the electricity generation business have been on the rise in the last few years. Annual capacity addition is of the order of 8-10,000 MW per annum, twice that witnessed in the years preceding 2007. Traditionally, the majority of new capacity is fired by coal, hydel and gas. Coal fires 60% of new capacity since 2007. The second spot, however, goes to an unlikely candidate that otherwise adds power in homeopathic doses only—renewable energy sources such as wind, biomass, small hydel plants (less than 25 MW) and solar. The momentum in renewable energy is better explained if we look at the regulatory aspect of the market. Distribution utilities are mandated by regulation to ensure that their power purchase menu contain a small portion of renewable energy. Moreover, states that are not blessed with renewable resources are forced to purchase renewable “credits" in the market that are “sheared" off the renewable electricity sold by the developer. The overall regulatory direction for this was set by the Prime Minister himself in 2008: the National Action Plan for Climate Change suggested a kick-off with 5% in 2009-10 rising by 1% every year for the next 10 years. Wind power leads the pack in the renewable sphere, accounting for 70% of the total installed capacity. The future outlook is quite promising: the tariff offers are proving to be competitive vis-a-vis conventional fuels, owing to rising global fuel prices. Moreover, in adversity lies an opportunity: for entrepreneurs in the power sector, it is safer to set up smaller projects than large ones, given the buyer’s plight—wind fits the story far better than conventional fuel-fired projects that find competitiveness in large scales. Not surprisingly, last week, investment bank Goldman Sachs decided to invest ₹ 1,000 crore in a start-up wind energy firm that is expecting to set up 1000 MW by 2015. 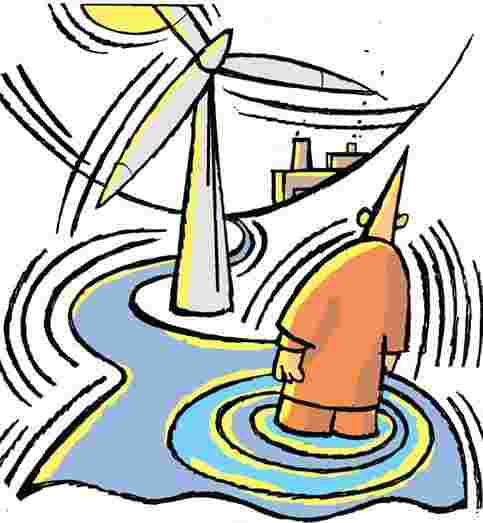 The experience in wind energy sector has lessons for its elder cousin—large hydro projects. In the last four years, the capacity addition has been a meagre 8% of what has been added overall. Just like renewables, India has a huge potential in hydropower too. The question is that of financing its development. Perhaps renewable power has some lessons here.